This post is by Lucy Chambers, Community Coordinator on OpenSpending. 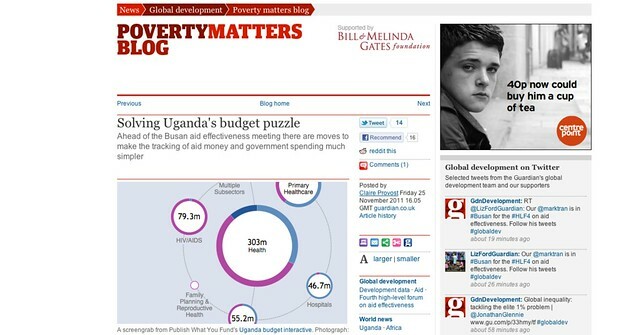 On Friday, the Guardian Poverty Matters blog published a piece on the Uganda visualisation that the OpenSpending team had been working on with Publish What You Fund. It is hoped that visualisations such as these will make it easier to digest complex datasets of this type, where a government receives support from multiple sources. It is also hoped that discussions around the topic will result in the more timely and regular release of data to help highlight practices that will lead to aid money being most effectively spent. Read the full Article in the Guardian Poverty Matters blog. Have data similar to this you would like to create a similar visualisation for? Drop us an email via the OpenSpending mailing list.